Equi-Tee Shake'n Rakes are built to manually or auto-sift beach, bunker, resort or other sand. They are available in two screen sizes sizes or finely spaced Mini-Tines and will efficiently sift debris down to 1/4 inch. They have a fiberglass hand pole with a comfortable ergonomic grip. They are chemical, oil, salt and heat resistant making them ideal as a beach sand cleaning product. They can be agitated by hand or come equipped with an integral motor so efficient cleaning of sand is produced with minimal labor. The motorized Shake'n Rake provides a high speed powered up-and-down (shaking) motion that mimics the manual lofting of the sand that was formerly done by hand. Using lithium-ion battery power, an integral reciprocating motor increases the lofting rate to up to 30 times per second. The task of moving damp sand through a screen can be accomplished without any manual agitation by the user, so fatigue is eliminated and productivity greatly increases! The Shake'n Rake takes a job that was nearly impossible and makes it routine by doing the sifting for you. "The Shake'n Rake is a wonderful idea and works great even in damp sand, easily outperforming manual sifting. It also leaves a nice raked surface, doing the work of two tools." David W., Superintendent, Chambers Bay, WA. The user-friendly manual Shake'n Rake is specially designed for those who can manually sift where there is no wet or damp sand. Optionally it can be ordered with a Mini-Tine basket for large debris. It is constructed with the same ultra-tough tines as the powered Shake'n Rake, virtually assuring that they will wear out before they break. Incorporating a patented "Flex" feature, user back strain is greatly reduced. This flexible design, combined with a comfortable hand grip and unusually light weight, makes this an exceptionally easy rake to use. The Science of Power Sifting. Bridging among wet sand particles is due to their angular shape and the water's surface tension. This bridging makes it difficult to get wet sand particles to fall through a screen. With a manual screened rake, you agitate the sand by repeatedly lofting or jiggling the debris, each time separating a bit sand through the screens. Because damp sand requires such a vigorous shaking effort, often these manual tools will only work in dry conditions. By contrast, the motorized Shake'n Rake is pure sand sifting magic, powering through dry sand as quickly as it can be put into the basket. Since it is powered it will even sift damp sand, a task that that humans cannot effectively perform it for very long. Equi-Tee powered Shake'n Rakes set themselves apart other power sifters by offering outstanding performance at a surprisingly low cost. 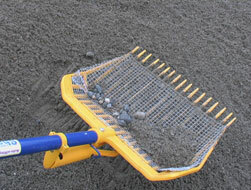 Equi-Tee rakes are the only auto-sifting hand tool. This rechargeable portable rake will help you clean sand faster and more effectively, and with less labor than any other hand method. The powered Shake'n Rake looks and feels similar to a conventional rake. The operator holds the rake handle normally and then, by depressing a variable speed trigger switch, moves the electrically powered basket. Only the tines “shake” and though they agitate 10 times faster than what can be done manually, there is no vibration into the hand pole, making the operation smooth and effortless for the user. Shake'n Rake bunker sand cleaning magic was recently viewed at the Chambers Bay, WA, golf course, site of the 2015 US Open, where this former gravel/sand pit had an ongoing rock contamination issue. The day was cloudy and rain had fallen earlier, a perfect test since bunkers must often be cleaned even in poor weather, which, ironically, may be the optimal time to groom them because the low play-through rates means not disrupting golfers. "Careful attention to details, and designed for long product life makes this Equi-Tee Shake'n Rake outperform any other!